10.10 sales has arrived a day late for me when STI has reached a low of 3047. Amidst the market downturn, I have managed to initiate a small position in CapitaRetail China Trust at $1.35 in Oct. At this entry price, it is trading at 12.9% discount to its adjusted NAV/unit of $1.55. 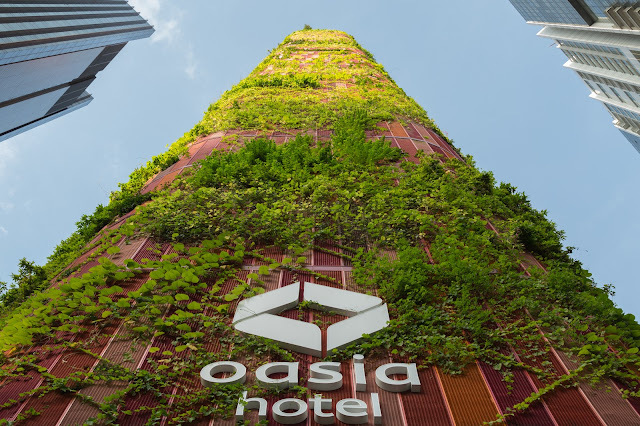 This translates to a distribution yield of 7.08% based on the annualised 3Q 2018 DPU of 2.41 cents. 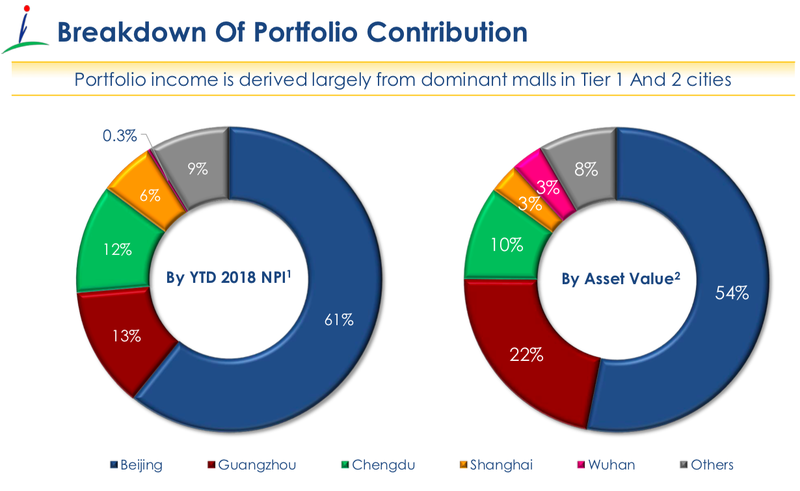 Breaking down by portfolio contribution, majority of the NPI and asset value of CRCT are derived from first-tier cities like Beijing and Guangzhou. In Sept 2017, CapitaMall Anzhen in Beijing was divested to its master lessor, BHG. The mall was master leased till 2025 (7 years remaining) with the competition of its disposal at 13% premium over its latest valuation. 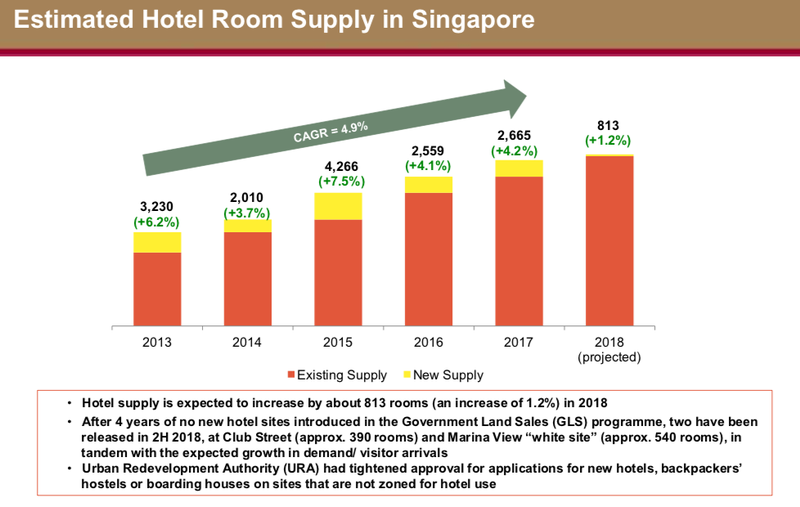 The Rock Square was recently acquired as part of a 51:49 joint venture with its sponsor, Capitaland in Jan 2018. The acquisition was 50% funded by debt, 28% cash and 22% by private placement proceeds. A private placement was carried out in Nov 2017 at $1.612 per new unit. With the increment in the number of outstanding shares, there could possibly be dilution to the DPU. The two malls that have been a drag on CRCT's performance are CapitaMall Wuhu and CapitaMall Minzhongleyuan. CapitaMall Wuhu has been undergoing tenancy mix adjustments since 4Q 2015. Based on the latest Financial Results, it appears that the mall is currently closed for rationalisation following the market exit of its anchor tenant, Walmart. There does not appear to be estimated timeline to its reopening at this moment. CapitaMall Minzhongleyuan was affected by a 28-months road closure at Zhongshan Avenue to facilitate the construction work of a new subway line in 2014. The new Line 6 of Wuhan Metro has subsequently commenced operations in Dec 2016. But not long after, the mall is currently undergoing recovery due to ongoing tenant mix adjustments for revitalisation. 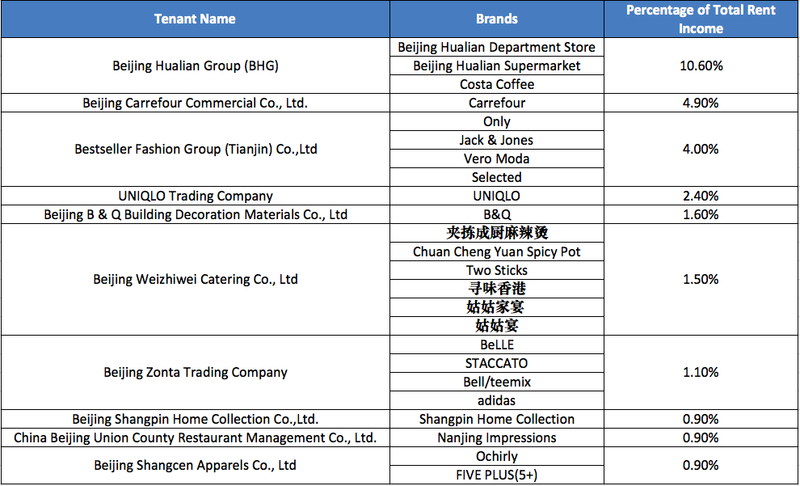 Upon examination of the top 10 tenants of CRCT, the only heavyweight tenant is the BHG which accounts for approximately 10.6% of the total rental income. This is followed by Beijing Carrefour Commercial Co., Ltd at 4.9%. Relatively speaking, I think that the tenant concentration risk is not that significant as there is only one major tenant with the remaining accounting for less than 5% each. This could also be due to the structure of the retail malls under the CRCT's portfolio with 7 of them being multi-tenanted malls and 2 master-leased malls. The divestment of CapitaMall Anzhen and the acquisition of Rock Square can also be interpreted as a shift of focus from master-leased malls to multi-tenanted malls. The NPI and DPU has declined 1.0% and 5.2% respectively in 2016, mainly due to unfavourable change in Beijing tax regime and weaker RMB against SGD. With the exception of the 2016, the DPU and NPI of CRCT have seen general trends of steady increment over the years. In 2018, the NPI for 9M has fallen by 4.0% year-on-year ("y-o-y") mainly due to the lack of contribution from CapitaMall Anzhen that was divested in 2017. Conversely, the DPU for 9M has increased by 0.9%, contributed by the joint venture in Rock Square despite the enlarged unit base. In terms of NPI, CapitaMall Wuhu and CapitaMall Minzhongleyuan have not been contributing much at this moment. However, there might be potential for NPI growth once the relevant redevelopment works have been completed. Based on the 3Q 2018 Financial Results, I am sanguine about CRCT performing better this year. 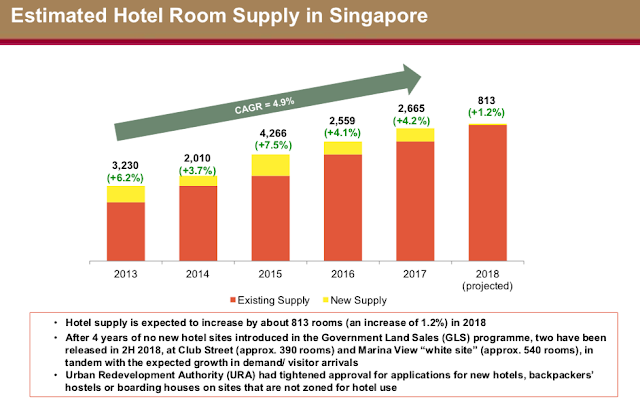 The overall occupancy rate for CRCT portfolio has increased 0.3% from the previous quarter and 0.01% y-o-y. 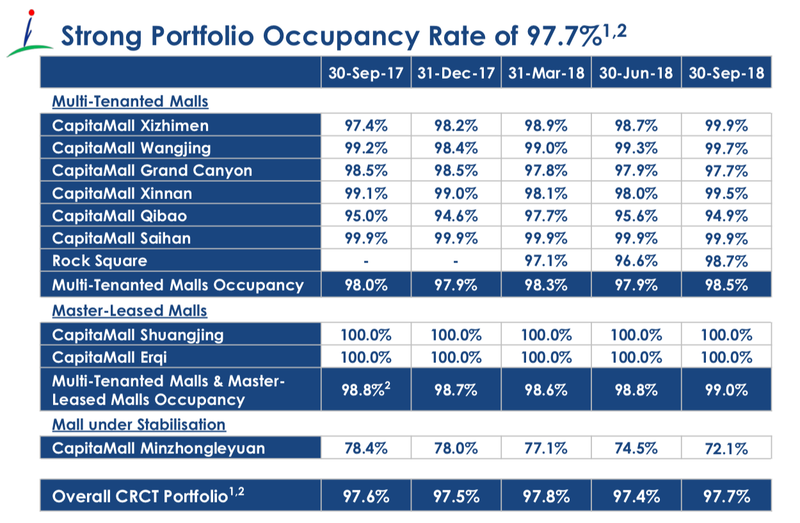 As mentioned earlier, the comparatively low occupancy rate for CapitaMall Minzhongleyuan stemmed from the ongoing tenant mix adjustment which has pulled down the occupancy rate for the overall portfolio. The occupancy rate for CapitaMall Wuhu has been excluded from calculation as it is currently closed for rationalisation. 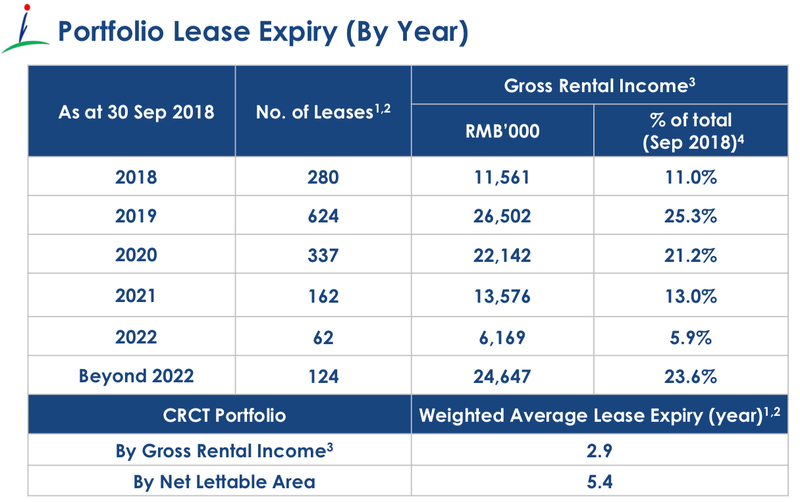 It is observed that bulk of the portfolio lease by gross rental income will expire in 2019 (25.3%) and 2020 (21.2%). 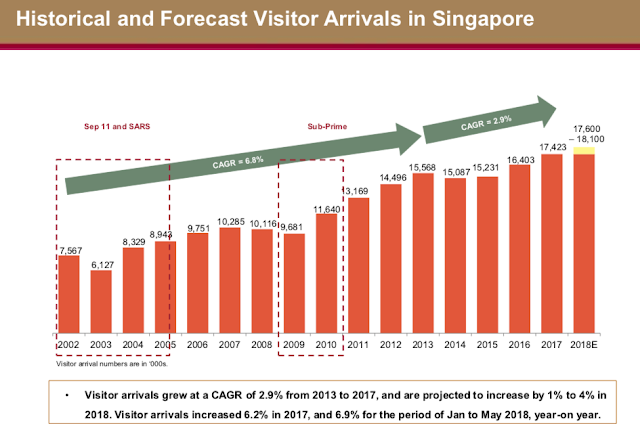 Given the focus on multi-tenanted malls over master-leased malls, CRCT's WALE tends to be shorter at 5.4 years and 2.9 years by NLA and gross rental income respectively. Generally, longer lease structure is largely preferred due to the stability and predictability of rental income. However, I feel that there are certain advantages to having shorter WALE, especially with CRCT's positive rental reversion underpinned by China's shift towards a consumption-driven economy. As of 30 Sept 2018, CRCT has a gearing ratio of 35.9%. 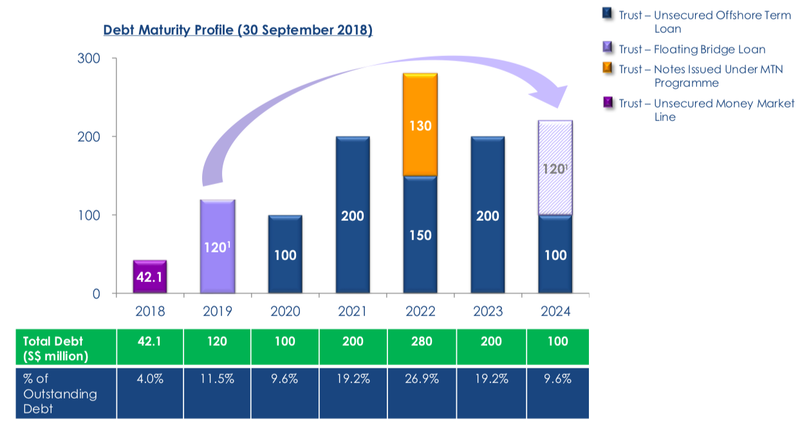 Benchmarking against the 45% leverage limit set by MAS for REITs, this provides CRCT some financial flexibility and debt headroom for any future acquisition if the opportunity arises. In the near term, $120m term loan has been secured and the refinancing will occur in Jan 2019 which extends its maturity to 2024. This brings the average term to maturity to 3.70 years. 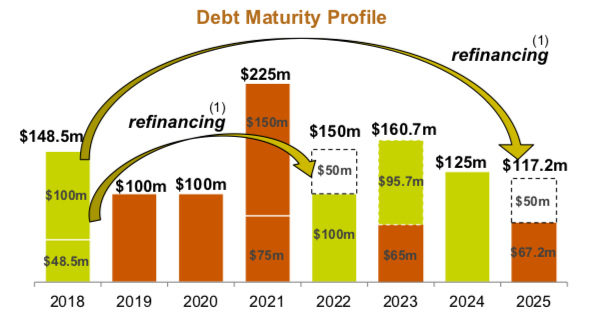 From the debt maturity profile, bulk of the outstanding debt (26.9%) will be due in 2022. Additionally, CRCT currently holds $142m of cash equivalent which may serve as buffer against financial risk. 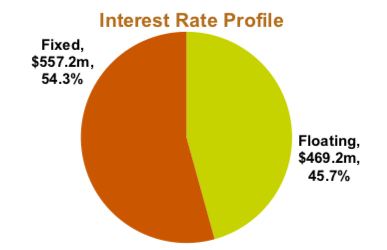 The interest rate exposure on its borrowing is 83% hedged by derivative financial instruments such as interest rate swaps. This helps to mitigate the impact of rising interest rate. Based on the past 10-years data of share price movement of CRCT, the average share price is at $1.378 as represented by the blue line in the chart. This translates to a mere 2.03% below the mean price for my entry price. Since 2013, CRCT's share price has mostly remained bounded within one standard deviation above the mean. Comparing CRCT against its peers, we can observe that CRCT produces the lowest annualised distribution yield. For Dasin Retail Trust and Sasseur REIT, their high distribution yields are partly propped up by financial engineering methods such as distribution waiver and income support. Notwithstanding the lower distribution yield, I would consider the value of buying into the 12-years track record of CRCT for steady increment in NPI and NAV over the years. Even though it has the highest gearing ratio among the China Retail REITs, its edge lies in having the lowest average cost of debt, likely due to the presence of a strong sponsor, Capitaland. Furthermore, a longer average term to maturity is instrumental in reducing the refinancing risk. 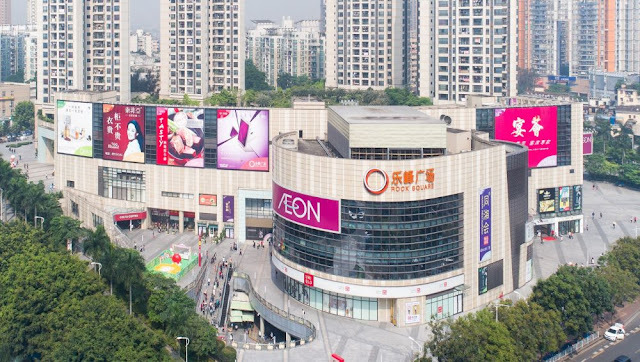 Despite the drag on performance by CapitaMall Wuhu and CapitaMall Minzhongleyuan, CRCT's occupancy rate is considered to be average when set side by side with its retail peers. Based on the 3Q 2018 Financial Results, CapitaMall Xinnan and Rock Square has achieved more than 20% rental reversion due to strong space demand between new and renewal opportunities. In general, the portfolio has seen positive rental reversion of 12.1% in the quarter. China has shifted its focus and pushed towards a consumption-driven growth model. This is evident with the 19.6% increase in total shopper traffic for CRCT and 21.4% growth in total tenant sales y-o-y. One of the greatest risks of this investment is the survivability of brick and mortar retailers in the face of the onslaught of e-commerce. This is especially relevant in the home territory to global e-commerce behemoths like Alibaba and JD.com. China's economy has also evolved digitally with the proliferation of mobile shopping and high penetration of cashless payment via platforms like Alipay and Wechat Pay. Despite the disruption by the emergence of e-commerce, I feel that the Online to Offline (O2O) business model can be incorporated into the retail industry in which online and offline channels can be treated as complementary instead of competitive. One good example of the O2O landscape would be Alibaba's Hema supermarket chain. Shoppers at the supermarket can use the Hema mobile app throughout the store to find out about the product information or order from the menu. Following Alibaba, JD.com has recently set up its technologically advanced supermarket, 7Fresh to blend the online and offline shopping experiences. Furthermore, one distinct advantage of retail REIT is that promotional and marketing initiatives can be carried out to drive shoppers traffic if necessary. Yuan has seen volatility amid the escalating US-China trade war. Being a pure-play China retail REIT, CRCT derives its income mainly in RMB. As its distributable income is in SGD, depreciation of RMB against SGD may lead to lower DPU to its unitholders. I would think that this is an inconsiderable risk as CRCT has mitigated the foreign exchange exposure by hedging approximately 80% of the distributable income into SGD. Business operations in China are often subjected to policy risk in the respective cities. For instance, the Beijing State Government has moved to align its tax policy with the national practice of charging property tax based on rental income revenue from July 2016. This has resulted in higher property-related tax expenses and inevitably affecting the NPI of malls located in Beijing. The retail landscape in China is decentralising with the creation of new retail zone to cater for developing residential districts. New mall supply in tier 1 and 2 cities in 2019 is likely to intensify competition among the retail malls. China does not permit private ownership of land and the maximum duration for a land use right for commercial property is 40 years. The specifics of the provision for the renewal of commercial property, as well as the basis for renewal fees remained clouded under the Property Law. Whilst there have been precedents for residential properties in Qingdao, Wenzhou and Shenzhen, the policies for renewal have remained largely localised. The retail malls in CRCT portfolio have their land use right expire in the period between 2040 to 2045, which is approximately 22 years away. To my understanding, the likely scenario upon expiry is that CRCT would be expected to foot the renewal fees in order to extend the lease. Alternatively, CRCT could divest the older assets and acquire younger malls as with the case for CapitaMall Anzhen and Rock Square. Either way, charging exorbitant fees or refusing the right to renewal would be economically destructive. At my entry price of $1.35, it would be a 12.9% margin of safety to its NAV. Comparatively, it might not pose a huge margin but I find comfort in the long track record of CRCT in enlarging its asset base and improving its NPI. While I am keenly aware that my portfolio might have been a tad overweight on retail REITs, I am positive of the dynamic new world of retailing led by rising momentum of the "New Retail" concept coined by Jack Ma in 2016. It brings alive seamless experience between the integration of offline and online logistics through the leveraging of data technology. In addition, with China shifting its growth model to one relying more on consumption and less on investment, I am optimistic that it could drive continued positive rental reversion for CRCT's portfolio.